Hello and welcome to my interpretation of the Spring Colors Tiddly Ink's Challenge! You may join us in the challenge here! This is my first time coloring up Forget Me Not Wryn! It may be difficult to see all of the little flowers on her dress as I covered them in stickler, but they are so pretty! Thank You mucho for stopping by! Have a lovely week!!! I hope you are well and enjoying Spring wherever you may be! This is a little card I made using Building Queen Wryn! She is such a sweet Tiddly Ink image! I love power tools and I'm sure I am not the only gal who loves the feel of a drill or power saw in my hand! And of course, an apron is a MUST! Luckily, I get to wear an apron and use a drill from time to time in my day job! #signartist Yay! I wish you a splendid day! "Learn to pause…or nothing worthwhile will catch up to you." This sentiment from a Tim Holtz cling stamp collection holds an important message. Many of us glorify being "busy" and in doing so, may miss out on the beauty that is constantly surrounding us. Beauty may be appreciated in a smile, a kind gesture from a stranger, a friend's laugh, a nice breeze, a pretty sunset or whatever beauty may mean to you. Please feel free to join in any of the Tiddly Ink's Challenges here or to just browse the digi and cling stamp collection at the Tiddly Ink's Shop here! 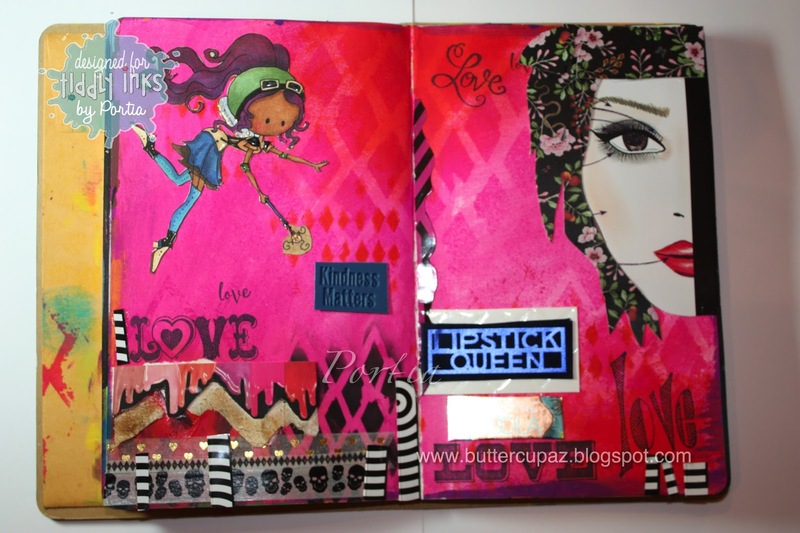 Materials Used: Grace's Wish digi, cling stamp sentiment and flourishes by Tim Holtz, dies, distress inks, copic sketch markers, black paint by delusions and black bow. Thank You for stopping by and Happy Fabby Friday!! !